You are here: Home / Health / Bring on the Awe! I heard a radio interview recently with Dacher Keltner. Ketlner is a professor of psychology at the University of California, Berkeley, the Director of the Berkeley Social Interaction Lab and the founder of the Greater Good Science Centre. I’ve followed Keltner’s work on compassion for years, so was interested to hear what he was researching related to awe, the topic of the interview. Awe, as a property, is vast. Its vastness could be physical, such as a beautiful mountain, sunset or other vista. The vastness could be epistemological, such as an idea or concept, as epistemology is about what we know. Awe can also be temporal, such as music, as it can stretch time. Music’s awe also comes from the possibility of causing us to transcend our understanding of the world (can’t fit it into the paradigms that we order our world with). Being in a state of awe is healthy for our bodies. Awe has been shown to reduce inflammation in the body. Awe also makes us more prosocial and awakens our mind. Awe has the capacity to move us from seeing not only our own limited point of view, but integrating the view of others, the social collective. Awe, Keltner tells us, is an antidote to narcissism and breaks down “us vs them” thinking. According to the research Keltner has, people tend to feel awe about 2.5 times a week. The types of things that stimulate awe can be someone’s generosity, strength or courage. It could be stimulated by a piece of art, an expanded sense of purpose or perspective. Or it can come from creative expression, one’s own or someone else’s. How much did you feel awe today? Someone I know asks herself something similar at the start of her day and then circles back at the end of her day to see how things measured up. A beautiful practice! Where do you get your awe? Today is my daughter’s birthday. 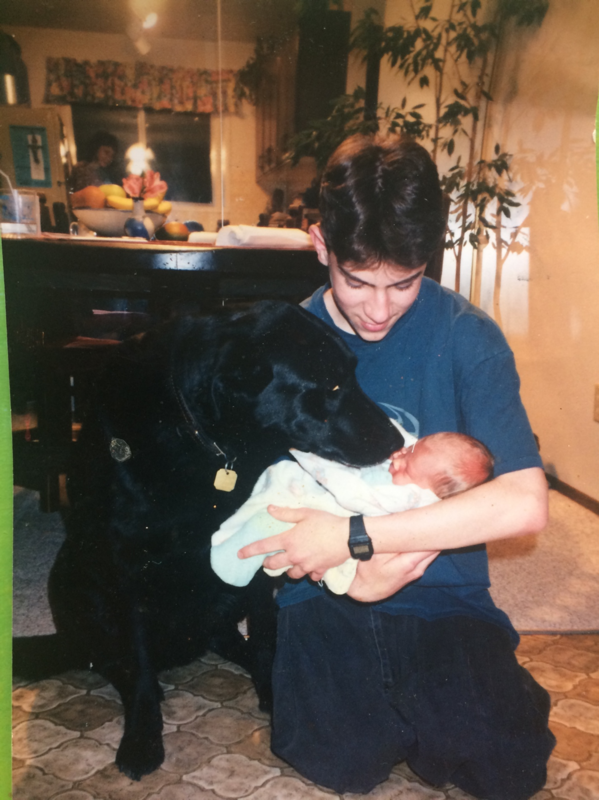 This picture, taken 22 years ago, with her brother and our dog, Neitzsche, inspires my awe.